« Out in the Open! 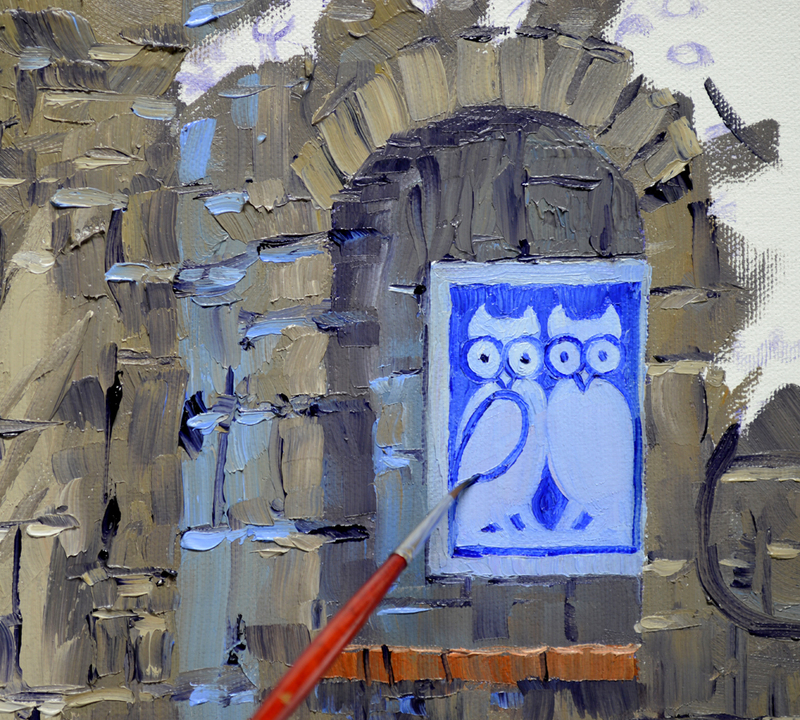 Jeana loves owls so I’m placing a tile with two of them in the niche. The outer border is blocked in first, then the dark blue background is painted around the shapes of the owls. 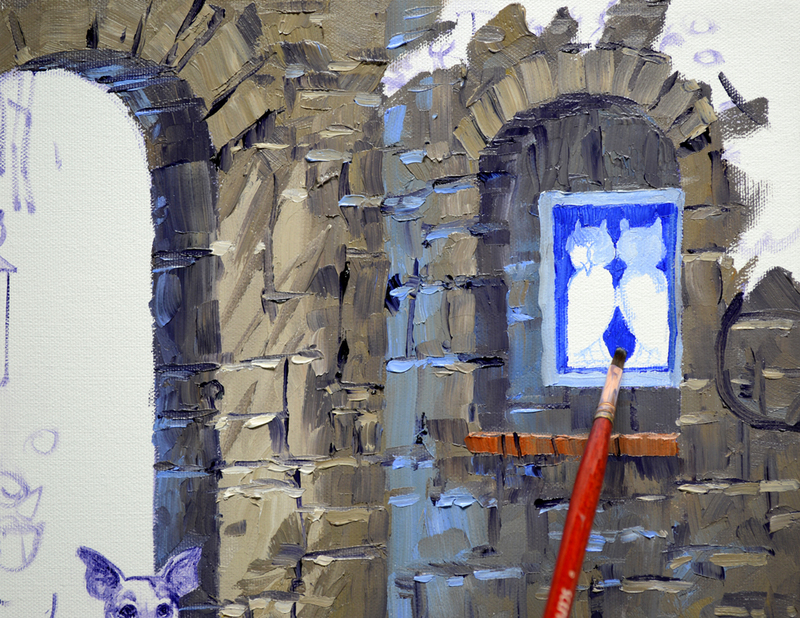 Ultramarine Blue + a tiny bit of White is used for the background. 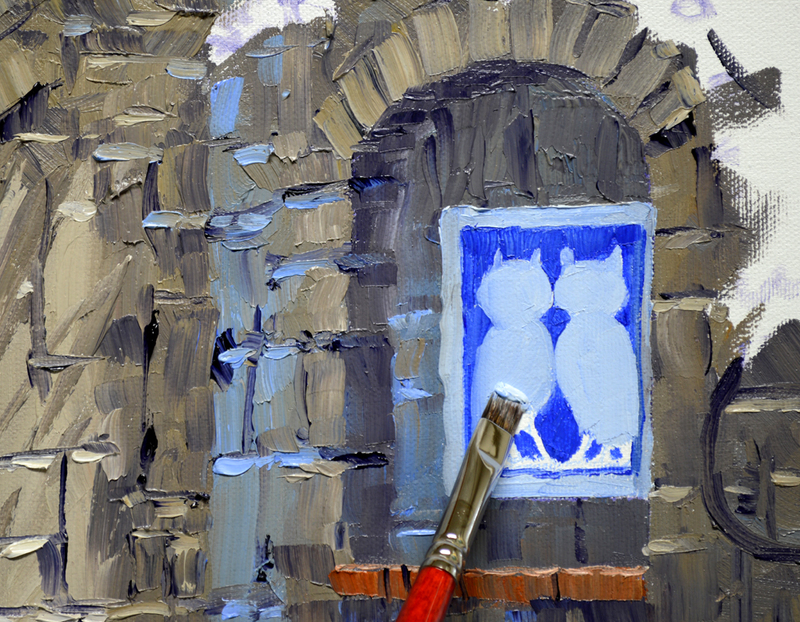 The heads and bodies are painted with a couple of mixes in different combinations of White + Ultramarine Blue + a touch of MUD (2 parts Ultramarine Blue + 1 part Alizarin Crimson). The same mixtures were used for the border. Using the dark blue mixture the owl design is completed. A special color is used for the door, Sevres Green. 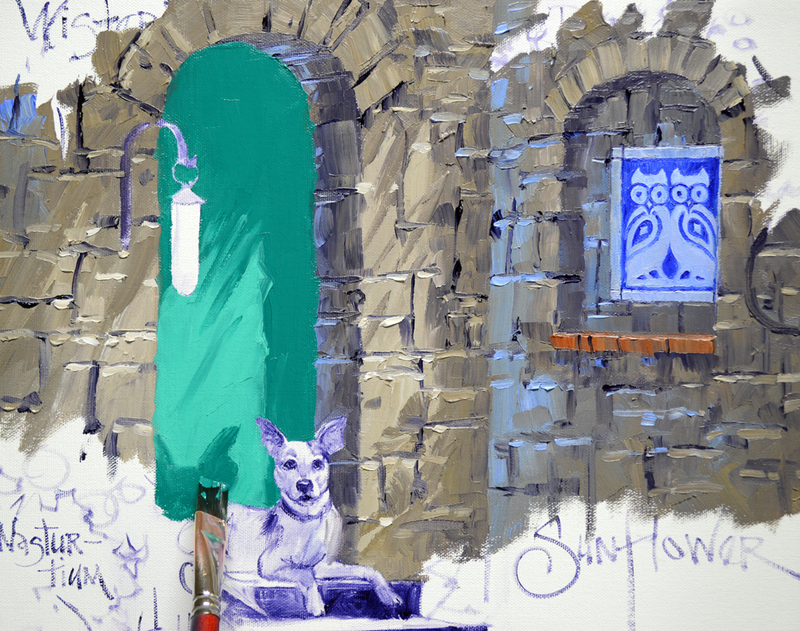 The shadow portion is Sevres Green + a little MUD + a tiny bit of White. The sunlit part of the door is Sevres Green + White. It’s fun figuring out the shadow cast on the door by Looka’s head and ears. 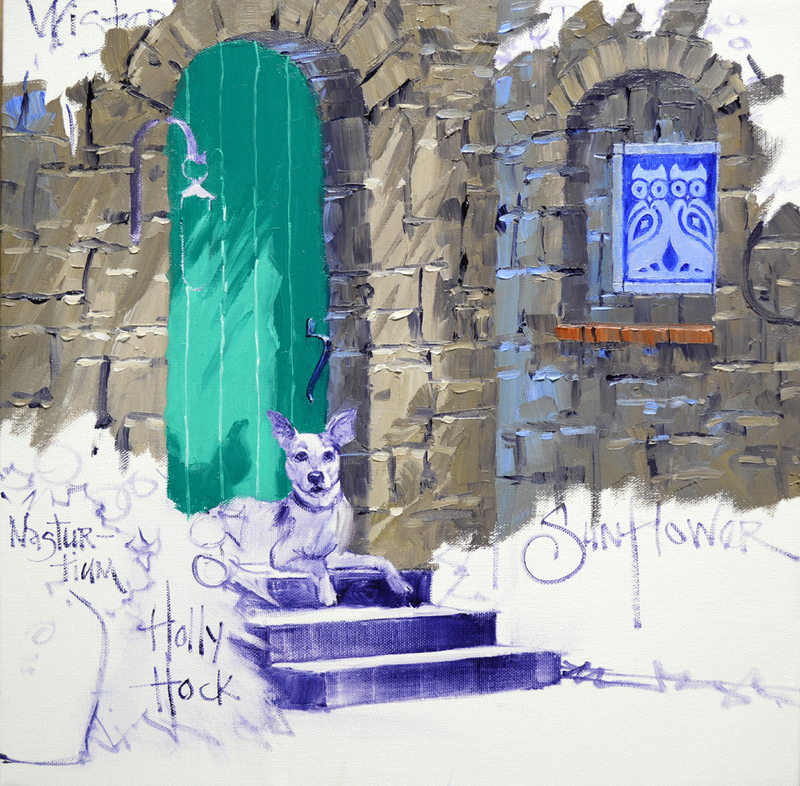 This entry was posted on January 10, 2019 at 1:33 PM and is filed under Original Oil Paintings. You can follow any responses to this entry through the RSS 2.0 feed. You can leave a response, or trackback from your own site. And I thought they were cats in the window! That’s OK! Love owls! Sure enjoy your u-tube videos!! So does Teanna! Thank you Pete and Julie, They did look like cats until I got the details in. Is Teanna still trying to help me paint the videos? My collector who commissioned the cutting horse painting has a cat and LOVED the video you sent of my painting assistant, Teanna! Wow Mikki…i think u have given new look to the walls wid old stone effect.so excited to see what u paint next!